When we first start out fly fishing and we’re still learning the mechanics of the casting stroke. It’s very common for many of us to make excessive false casts in between our presentations. For some of us, excessive false casting is an excuse to impart quality control during our fly casting, for others, we justify it for the simple fact that we just love casting a fly rod. Whatever the reasons may be for excessive false casting, it needs to be kept in check, if anglers wants to fly fish at their best. If you’re currently in the beginner or intermediate skill level range, one of the best ways to take your fly fishing to the next level, is to make yourself minimize your false casting on the water. I can remember like it was yesterday, when I finally made the decision to cut the number of my own false casts in half. There I was, twelve years old, wet wading for shoalies and sunfish on my home waters, ready to stray from what had grown to feel comfortable to me. At first, I hated the change. It made the majority of my presentations feel rushed, but eventually, I noticed my casting started to improve significantly. I found by not giving myself the luxury of extra false casts, it forced me to pay closer attention to my casting technique, and all aspects of my fly casting improved. I found that false casting less, I no longer found myself saying, “I should have let that last cast go, one false cast earlier”. Tangles became less frequent, I spooked less fish, and I seemed to get the fly to my target quicker. Remember, if you’re false casting twenty times, in between presentations, it’s only a matter of time until you’ll lose your focus and technique. And when that happens, you’ll usually end up with a poor presentation. From a beginners stand point, extra false casting can at times seem necessary, but from a veterans point of view, it’s inefficient and a waste of time. The more we cast, the more worn out we get during the day. 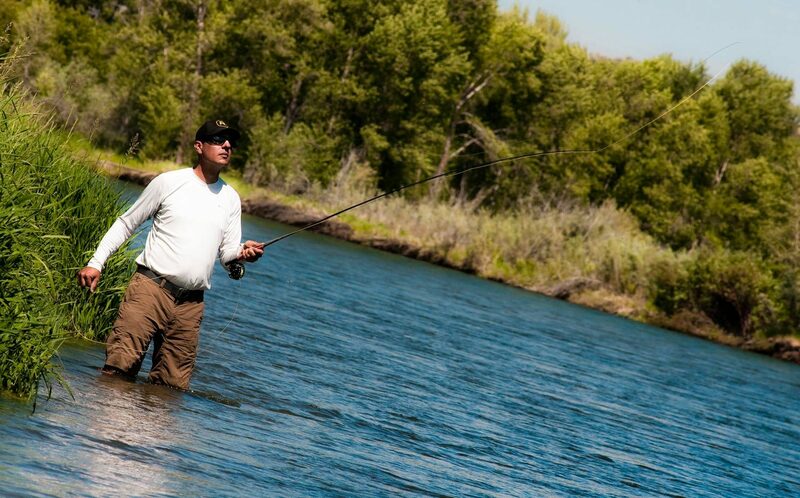 Angler fatigue directly effects our fly fishing performance on the water. If you’re going to add extra false casts prior to your presentation, make sure it’s called for. That way you’ll have enough gas left in the tank to finish the day off strong. Every time you make a cast, your brain has to focus on each element of the casting stroke. Have you ever noticed that the amount of tangles you get on the water increases as the day goes on, particularly during the last couple hours of the day? This doesn’t happen all of the time, but I’ve noticed as mental fatigue sets in and focus becomes harder to maintain, anglers make much more mistakes on the water. If you learn to cut out extra false casting when it’s not needed, you’ll be able to maintain sharp focus for longer periods on the water. Sometimes we have all the time in the world to present our fly to fish, and a few extra false casts is not a problem. Unfortunately, we don’t always have unlimited time to make our presentations when we’re fly fishing. For example, quite often when we’re floating down a river in a drift boat, we may only have 2 or 3 seconds to present our fly. In this fly fishing situation, there’s no time for extra false casting in between our presentations. To be effective, anglers need to be able to present flies accurately without the need for extra false casts. If you reguarly fly fish, you’ve probably been in a situation where too much false casting put down or spooked the fish you were trying to catch. When fishing conditions have fish on high alert, anglers can really increase they’re success if they minimize their false casting. Today’s fly fishing tip about limiting your false casting is a simple and effective way to help you improve your casting efficiency, cut down on the down time of untangling knots, and increase your catches. It’s the little things that make a huge difference for the fly anglers moving up in the ranks. Try it out next time you’re on the water and you’ve had some time to warm up. Force yourself to decrease the number of false casts it takes you to make a good presentation. At first you’ll likely only be able to eliminate one or two false casts. However, with some practice, you’ll be able to cut them in half. Lastly, pay attention to where the fly you’re casting is pausing in between your forward cast and backcast. If you’re getting the proper distance to your target after a few false casts, there’s no need for you to make more false casts if you’ve already got sufficient line out and the fly is on target. Just present your fly and see what happens. This entry was posted in Fly Casting, Fly Fishing Tips & Technique by Louis Cahill. Bookmark the permalink. Amen! Stop-stop & drop, Drop, DROP! Reluctance to commit is a common trait among new and casual anglers. I have been much more aware of not letting people that I work with make too many false casts on the lawn. Sometimes getting new casters to shoot a little line seams to help but that brings it’s own devils with it. You still have to reinforce it on the stream. DROP! Great post. Good points Kent. I think fly fishing is more like hunting than most forms of angling. Once a hunter identifies his quarry, or at least where he lives, he wouldn’t wave his arms over his head and give away his presence. It’s the same with excessive false casting. Great reasons to limit false casting. I knew about 3 and 4 but the other two are new. It might also be worth mentioning that there are some older G&G posts that can help reduce false casting… like the one about shooting line on your back cast. One of the problems I have observed regarding too many false casts, is that the ”false” cast is being used to get more line in the air to extend the distance of the cast to the target. There seems to be a reluctance to make one backcast then a final false cast, shooting line on that final delivery cast. amen! one major point left out is that every false cast has the potential to end in a disaster, especially if it’s windy. when trout fishing, i think the goal for casts less than 50 feet should be- 1 backcast, followed with the delivery cast. it truly forces one to focus on making a good backcast. right on! a major point omitted is that every false cast, especially on windy days, can lead to a disastrous outcome. I encourage students to make just a backcast and final cast for any cast less than 50 feet. it truly forces one to focus on making an excellent backcast, one of the keys to good casting.